The recent string of devastating natural disasters across North America had us in the environmental remediation industry thinking a lot about gray and black water. 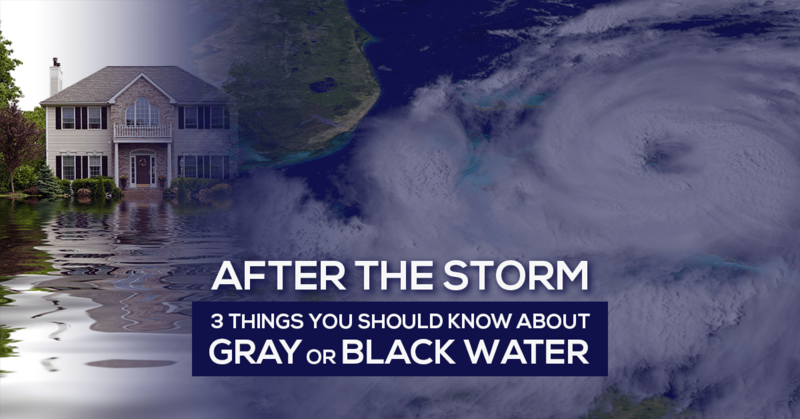 There’s many ways gray or black water can occur – but the primary cause in a residence is due to flooding from rainwater leaks, groundwater intrusion, pipe bursts, sewage back-ups, and raised rivers, lakes, and oceans due to storms and hurricanes. What is the difference between gray and black water? Gray water may cause a health risk since the waters may contain chemical or biological contamination. These waters include discharges from dishwashers, washing machines, sinks, showers, aquariums and waterbeds. Black water is a definite health risk. These waters may contain multiple and potentially harmful contaminants. It includes floodwaters containing soil and any sewage waters. All raw sewage is contaminated with microbes, including bacteria, protozoans, molds, fungi and viruses, many of which are pathogenic to humans. Microbes from this source certainly cause many diseases. If gray water is not dealt with in the first 48 hours of being in a residence, it becomes black water. Gray or black water is present. Now what? Time is of the essence. The top priority should be to dry out the property as soon as possible. If the property is dried out within 48 hours and the source of the problem has ceased, further problems are unlikely from the contaminated water. What help exists for remediating? For those in the Massachusetts and Rhode Island areas, Banner Environmental provides both black/gray water cleanup. Our team will remove and dispose of standing water and damaged porous materials, dry affected areas, then clean and sanitize building contents, structural support systems and HVAC systems. Once completed, a retest is conducted to certify the building is safe to be re-occupied. Luckily, New England has been mostly scathed in the past year for natural disasters, but we’re still susceptible to the same things that Texas, Florida, and Puerto Rico experienced early this year. Review the necessary steps for taking care of gray or black water, and when that unfortunate occurrence takes place, know the necessary actions. To read more about Banner Environmental’s gray and black water clean-up, click here.